Hi! Just wanted to drop a word of encouragement. Stumbled across your blog this morning and immediately connected with your words! I never even knew I could sing until last year, because I was always doing harmonies for the key of A (or another male key). Worship has always been a huge part of my heart (I play piano and have been on a team for years! ), but I just started leading worship songs at my church. Our church is currently all male worship leaders (five male leaders across three campuses). I have been encouraged to step up by these leaders and more people, but I don’t think anyone realizes just how different male and females lead – everything from communication with the team to music style to song key. (I especially don’t think that our leaders understand the key difference of male and females!) Anyways, we have a women’s conference coming up, which is making me (freak out!) look into more resources of how I can be a stronger, more effective worship leader – specifically as a female for females! I can’t wait to dive deeper into your blog and YouTube videos. I will be following you on social media and looking forward to all that will come from you! I think your recent goal to empower female worship leaders is BRILLIANT, and I can’t wait to see what is to come from you. This message reminded me that my effort to encourage and be a resource to women in worship is truly something I feel called to. I feel as if I am right where God wants me to be and the things that I am writing about are actually making a difference in some people’s lives (even when I think I am not making any dent at all). So I am writing this update to ask for your help. Will you be a part of empowering these women… specifically the ones that keep reaching out for support and encouragement? I have 35 hours left to raise $50,000 and I need all the help I can get!! Would you consider making a donation and/or spreading the word to anyone and everyone possible? I can’t do this without you!! Thank you from the bottom of my heart!! I have had the privilege of leading worship at my home church, Christ’s Church of the Valley in San Dimas, CA, for 7 years now. I love my church and my community… and I LOVE what I do. Although different than what I thought I might be doing in life, I feel as if I am right where God has called me. And that is a fun and exciting place to be! But like anything else, a calling comes with its share of obstacles. Although trying at times, it has been an amazing learning experience. I have learned how to rely on God when feeling alone, and I have learned to believe in myself and the calling God has on my life. As a result of my own journey, my passion has heavily turned to equipping and empowering women, specifically women in worship. I want women all over the world to know they are valued beyond measure, that they have unlimited potential, and that they have a unique gifting and calling within God’s kingdom. And the more I dive into this calling, the more I feel God shaping it. Deep in my heart I feel like this calling is going to turn into something bigger than myself. Have you ever felt like that? 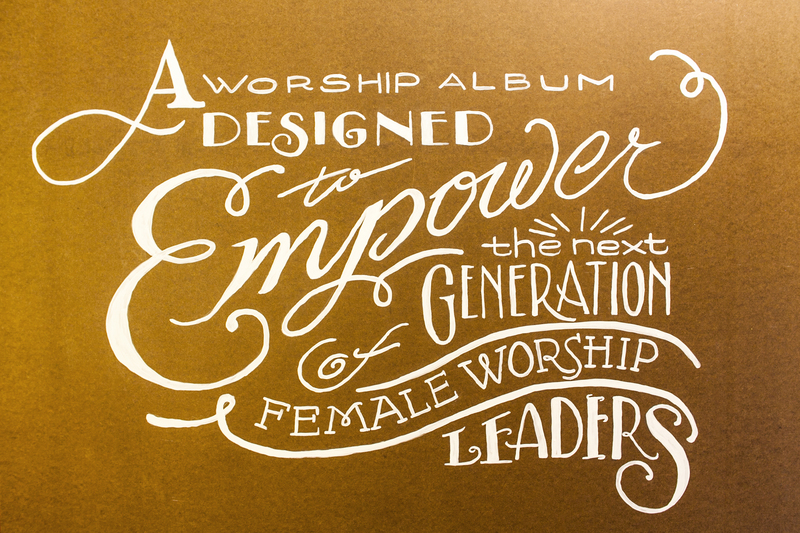 I know this to be my first step: A WORSHIP ALBUM DESIGNED TO EMPOWER THE NEXT GENERATION OF FEMALE WORSHIP LEADERS. But what comes next? I don’t know. This vision is what I will start with, and who knows what it will turn into. That is why I love serving God and trusting in his sovereign will for my life. Because he always has a plan, and I can’t wait to see where He takes me on the journey of empowering women in worship. Joshua was called to lead the people of Israel into the land the Lord had sworn to his ancestors. What a daunting task! He was about to face many cities in war, and he was going to confront many people who didn’t want the Israelites in their land. Joshua could have easily said, No God. Choose someone else. I am not ready for this task and I don’t have enough faith in your provision. But he didn’t. Instead, he obeyed and followed God. He was strong and courageous as the Lord went before him to claim the promise land. Although I have a long, daunting task in front of me, I am inspired by Moses’ words to Joshua and I picture him saying them directly to me. “Be strong and courageous… the Lord himself goes before you and will be with you.” I love what Christine Caine says in her book, Undaunted, “What is impossible with people is POSSIBLE with God. We just have to believe that God has called us to go into the world in His name, and not listen to the crippling or even paralyzing labels and limitations imposed on us by others. We cannot allow them to DAUNT us. Whom God calls, He qualifies.” God will qualify and provide according to His will. I have no need to be afraid.